One thing many people don’t realize about living in Alaska is how absolutely MASSIVE it is! From north to south, Alaska is 1400 miles long. That’s about the distance from Miami to Massachusetts! 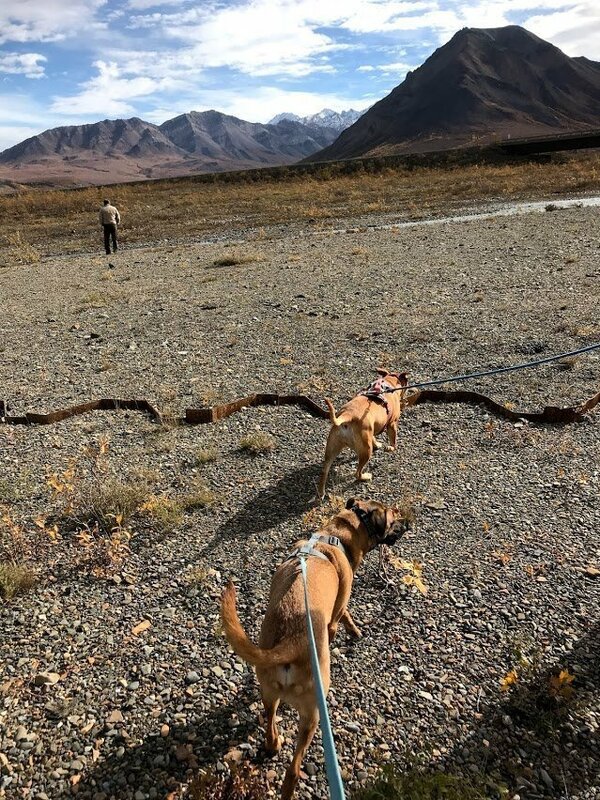 There’s virtually no way to see it all, but we try to load up the pups and head out for road trips as often as possible. 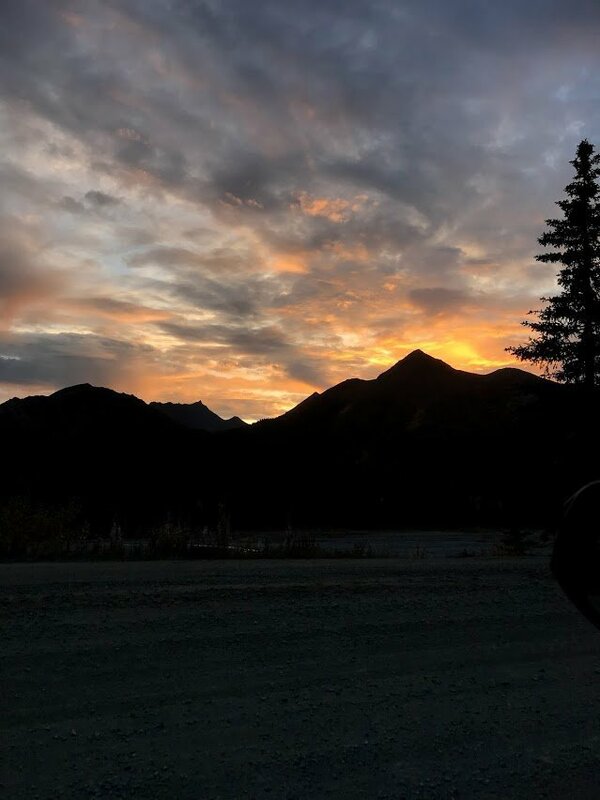 That’s why, when we found out we were selected in the Denali Road Lottery to drive our personal vehicle all the way to the end of the park road in Kantishna, we didn’t hesitate! Read on to learn more about our road trip! What is Denali, and Where Is It? Denali is the highest mountain peak in North America, and has an elevation of 20,310 feet above sea level. 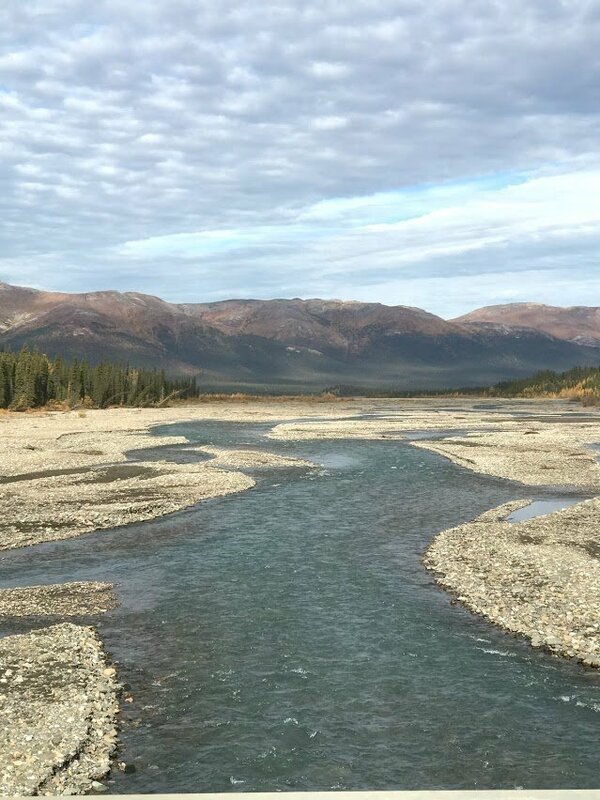 The name Denali is Athabascan, and is thought to mean either “The Great One” or “The Tall One”. And it certainly is great! It’s located inside Denali National Park and Preserve, which encompasses over 6 MILLION acres. Told ya everything is big in Alaska! There’s tons of wildlife in the park, including bears, wolves, and moose. 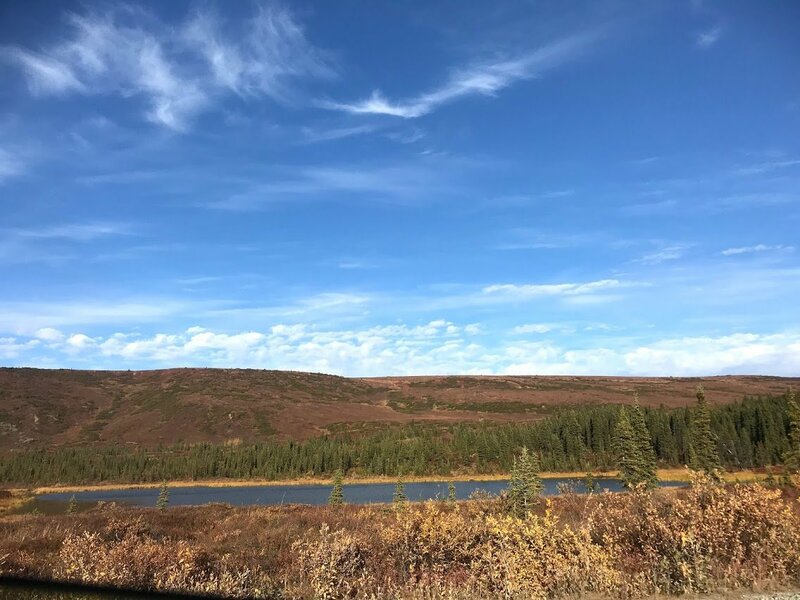 What is the Denali Road Lottery? Typically, the main way visitors get to see Denali is from tour buses. Personal vehicles were allowed in the mid-1980s, but the park was receiving up to 2,000 vehicles a day. 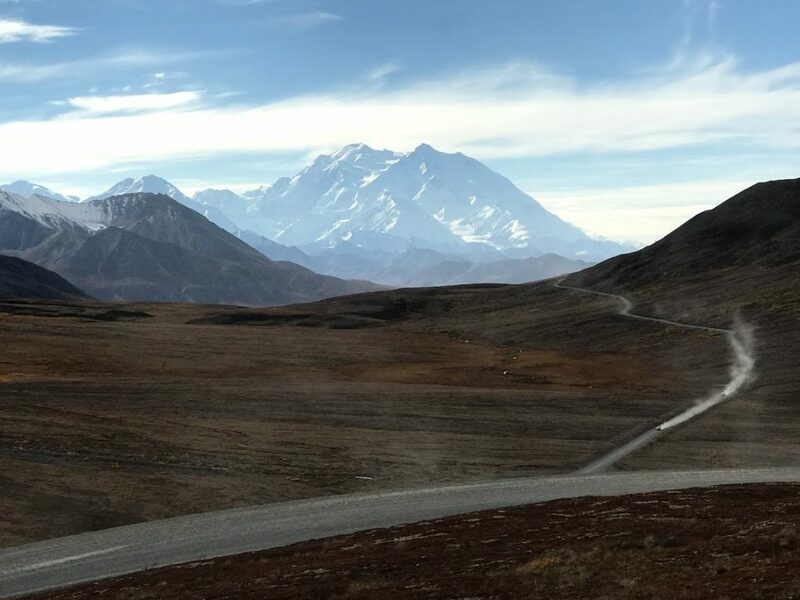 It wasn’t sustainable to handle that many visitors, and was a danger to wildlife, so the Denali Road Lottery Permit system was implemented. 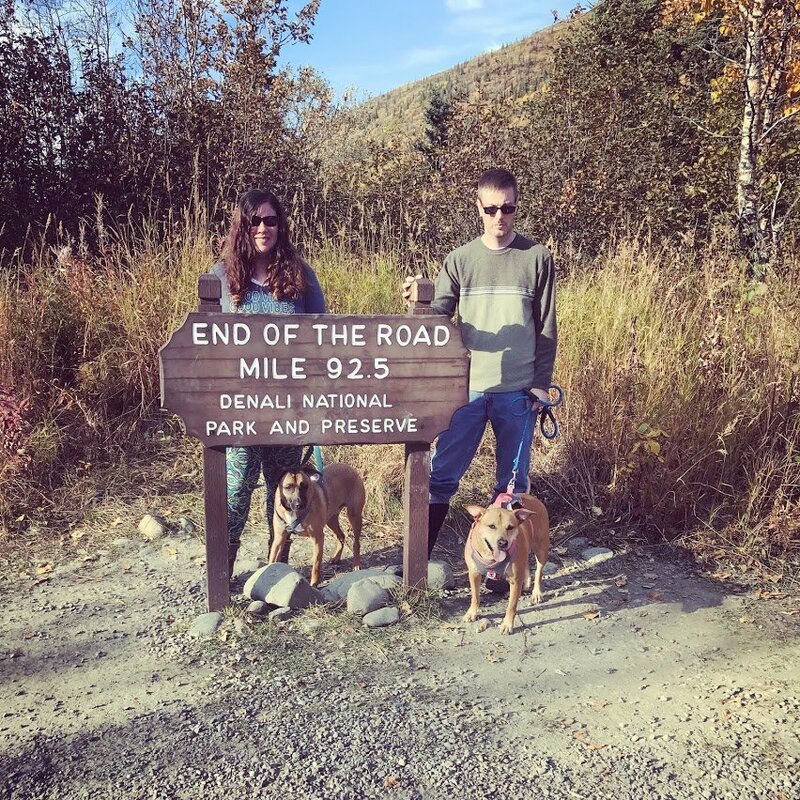 Every September, the National Park Service holds a 5-day event, the Denali Road Lottery, to allow permit holders access to the end of the road, 92.5 miles down, all the way in Kantishna, Alaska. Only 400 vehicles a day are selected, so we felt pretty lucky to have been chosen! In fact, we were vacationing with my parents and even convinced them to change the date on their return trip home so they could see it too. Plus, access is completely dependent on the weather and has been known to close due to snow. We were lucky and had warm, sunny temperatures. How Do I Enter the Denali Road Lottery? The road lottery entry period varies each year. The 2018 lottery application period was May 1—May 31, 2018, so future years should be around the same timeframe. To enter, simply visit Recreation.gov during the entry period and pay the (currently $15) non-refundable application fee. At this time, you select your preferred visit date. They also offer 400 passes to the local military bases, which is how we received ours. All entrants are notified via email if they won or not, so keep an eye on your spam email just in case! What Should I Do To Prepare for Denali? Planning is key for a successful trip, so we made sure to stock up on essentials. We packed a cooler full of drinks and snacks for us humans. We also brought plenty of food, water, poop bags, and backup leashes for the dogs. In addition to food and drinks, we made sure our emergency kit was fully stocked. The spare tire was checked over, a portable air compressor was tucked away, and our toolkit and emergency flares were loaded up. If you have a large truck or other vehicle that’s not quite fuel-efficient, you’ll want to bring some extra gas. I also packed some towels, window wipes, and Windex. It may sound a little extra, but since Denali is so very remote, it’s better to be safe! Luckily we didn’t need much besides the Windex and wipes as the roads were extremely dusty. We lost track of how many vehicles with flat tires we saw, and I was grateful to have taken some precautions just in case. After a good breakfast for us humans and the pups, we set out on the road nice and early at 6:30am. 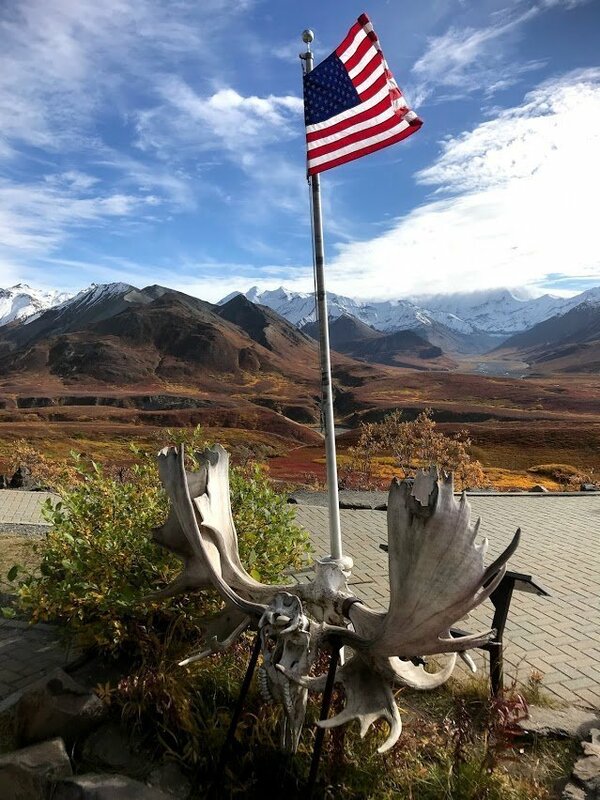 The town we live in, Palmer, is a few hours away from Denali National Park. Once the sun rose, it was incredible to see Denali from the highway and it only got better as we moved closer. 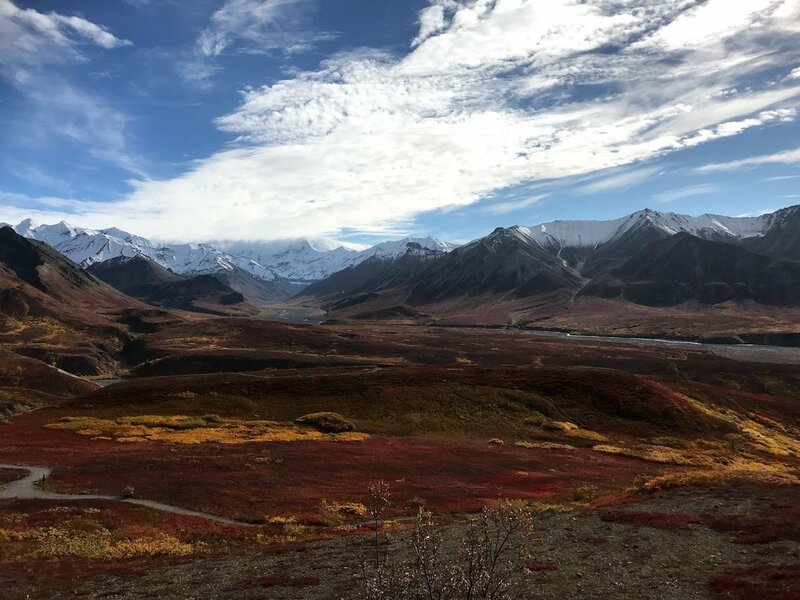 Only around 30% of visitors actually get to SEE Denali due to weather, so we were especially thankful! We stopped for gas in Cantwell, the last town with a gas station, before turning on Park Road. After a quick photo op at the sign, we stopped at the Visitor Center to grab our pass and head down the road! Along the way, we saw a few bears, birds, marmot (ground squirrels) and magpies. We didn’t get lucky with moose this time, but my parents will be back next winter so hopefully they get to see a moose for the first time then! 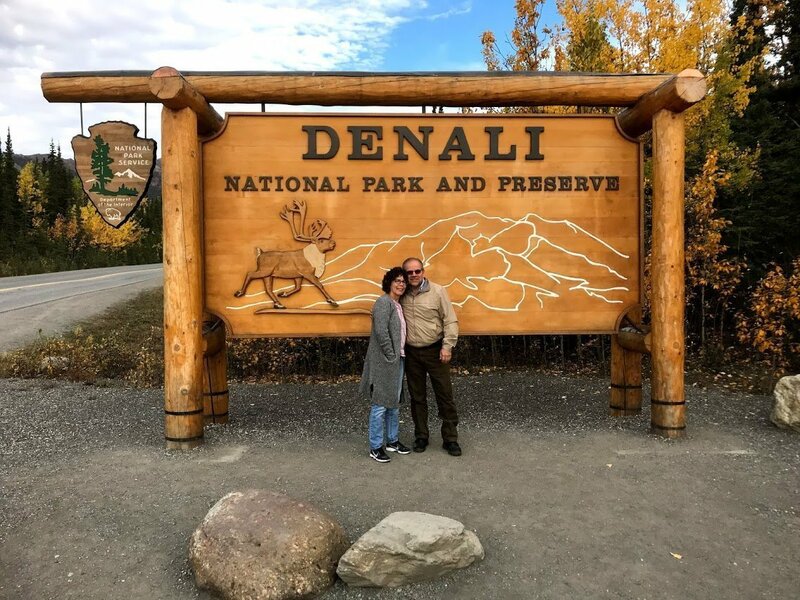 Along the way, we stopped for tons of photos, as Denali in the fall is especially breathtaking! Polychrome Pass, a winding, narrow cliff-side road, was a bit intimidating, but we handled it well. Around 5 hours after entering the park, we finally made it to the end of the road! We then started the trip back home. It was a long, long day, but it was completely incredible and absolutely worth it! A lengthy road trip definitely requires some planning, but these tips will make it easier. 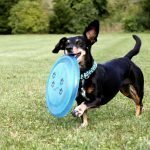 First, you want to make sure you have plenty of food and water for your dogs. Always pack a little extra food than you think you need. 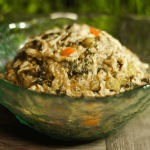 Your trip could take longer than expected, or your dog could be a little hungrier than usual. We add a comfy bed to the back for Roxy & Rico to get cozy on. If your dog is anxious during car rides, CBD oil can help ease their stress a bit. We’re fans of King Kanine CBD oil with lavender. 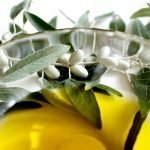 Learn more about the benefits of CBD oil here! You’ll also want to verify your dog’s collar is secure, and you’ve brought their harness and leash. Plus, bring plenty of poop bags. 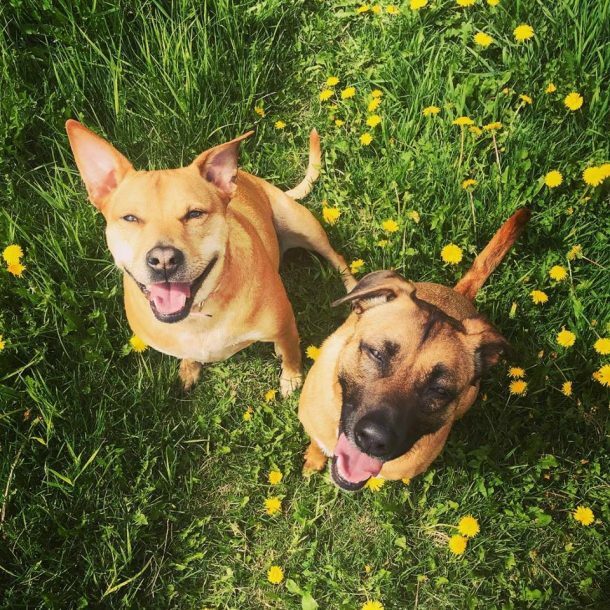 No one likes walking down a trail and stepping in fresh dog poop, so please pick up after your pup! Stopping frequently helps ward off cabin fever, and allows everyone stretch their legs and enjoy the sights and smells. That will help keep everyone happy!